We love lasagna at our house. But I rarely buy lasagna noodles to make it because there aren’t as many sales and coupons available for lasagna noodles as there are for spiral and rotini noodles do. 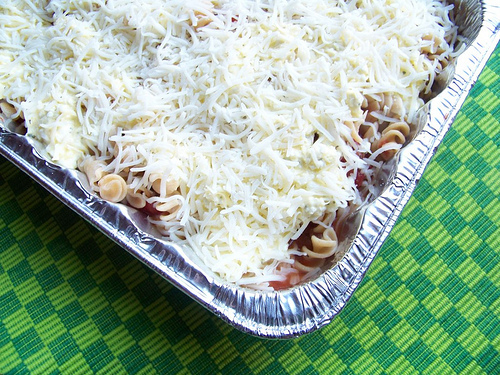 So, a number of years ago, I re-did our regular lasagna recipe substituting spiral/rotini noodles for lasagna noodles and dubbed it “Lasagna Casserole”. It’s become a staple recipe at our home and it’s one of the first things I consider making when I find marked-down cottage cheese at Dillon’s. Back when we were first married, we just left the meat out of this recipe, since it wasn’t in our budget. We like it better with meat these days, but it’s still hearty as a meatless casserole.